Let me once again thank one and all for your continued support and encouragement as we fight for Jesus Christ, His Holy and Indefectible Bride the One, Holy, Catholic and Apostolic Church, and for the Vicar of Christ the Roman Pontiff, and the Petrine See. To say that the past few days have been momentous would be putting it very, very mildly. While I obviously can’t spill my guts, I do want to give you all HOPE. And boy howdy, can I ever. Folks, keep praying. Our Blessed Lord is up from His little post-prandial snooze in the back of the boat. He’s up. Be filled with hope! Be of good cheer! Be bold in prayer! Remember our team of intercessors, Blessed Emperor Charles I and Zita, St. Vincent Ferrer, St. Catherine of Siena, St. Athanasius, St. Peter, St. Joseph, and Our Lady Undoer of Knots. If I may ask, would you all join me in prayers of Thanksgiving for graces already received, most particularly those of the past few days? Don’t worry – Our Lord knows EXACTLY what you will be referring to. Just say, “the Ann stuff”. And, it is always good to offer Thanksgiving IN ANTICIPATION for graces that we know will continue to come, because we have FAITH and HOPE. Might I suggest the Glorious Mysteries of the Rosary? The Fruit of the First Glorious Mystery (The Resurrection) is FAITH, and the Fruit of the Second Glorious Mystery (The Ascension) is HOPE. And, of course, the Fruit of the Fifth Glorious Mystery (the Crowning of Our Lady as Queen of Heaven) is TRUST in Mary’s intercession. Now, back to the business at hand. Have you bought and read J. Michael Miller’s doctoral dissertation, “The Divine Right of the Papacy in Recent Ecumenical Theology” yet? The online version is only NINE BUCKS. What possible, possible reason could there be to NOT engage this veritable Rosetta Stone of a text? I type up the text so that it will populate into search engines, and a photo of the citation is below. Emphases mine. 55. Patrick J. Burns in “Communion, Councils, and Collegiality: Some Catholic Reflections,” in Papal Primacy and the Universal Church, 171, states: “Current historical research on the origins of Roman primacy and episcopal collegiality will inevitable produce more qualified Catholic interpretations of the canons of Vatican I.” Ratzinger takes a somewhat different approach. 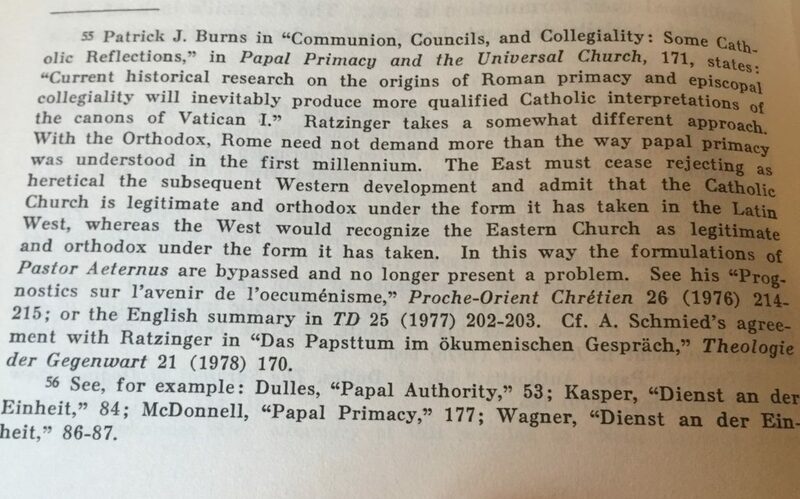 With the Orthodox, Rome need not demand more than the way papal primacy was understood in the first millenium. The East must cease rejecting as heretical the subsequent Western development and admit that the Catholic Church is legitimate and orthodox under the form it has taken in the Latin West, whereas the West would recognize the Eastern Church as legitimate and orthodox under the form it has taken. In this way the formulations of Pastor Aeternus are bypassed and no longer present a problem. See his, “Prognostics sur l’avenir de l’oecumenisme,” Proche-Orient Chretien 26 (1976) 214-215, or the English summary in T[heological] D[igest] 25 (1977) 202-203. Cf. A[ugustin]. Schmeid’s agreement with Ratzinger in “Das Papsttum im okumenischen Gesprach,” Theologie der Gegenwart 21 (1978) 170. Ummmmmmm, you think this might merit a look-see? Just a little peek-a-boo, just for giggles? Considering that the standard of schism is, in fact, unity with the Petrine See? Ummmmm, because Jesus Christ said so. But you know that “Wozu…” is going to be the full warplan of Walter Kasper against the Papacy laid out in detail. Again, this MIGHT be something of relevance and importance, considering that Walter Kasper has his hand up his personally installed Antipope puppet’s back and is calling the agenda of the Antichurch, and has been for six years now. Again, deepest thank to one and all, and keep up the prayers of supplication AND of Thanksgiving!! This entry was posted in Uncategorized on January 28, ARSH 2019 by Ann Barnhardt.